Oda Slobodskaya, born 28 November 1888 in Petrograd (one source says Vilnius) died 29 July 1970, was a famous soprano who made her debut as Lisa in Tchaikovsky’s Pique Dame at the Mariinsky Theatre. 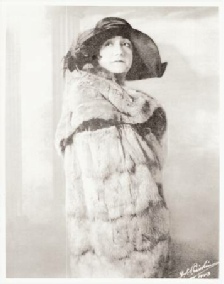 Oda Slobodskaya "I'm sitting on a stone"
Her biographer Maurice Leonard quotes her birth date as 28 November 1888. Her parents worked in a second-hand clothes shop in the village of Vilno (near the Polish border). She won a scholarship for secondary education, but at the end of this found herself working in the clothes shop, which displeased her. From amateur singing efforts she was aware she had musical gifts, and in 1907 she applied for an audition at the St Petersburg Conservatoire. The director, Glazunov, and her subsequent teacher, Natalya Iretskaya (one of the best Russian tutors) accepted her, and both awarded her a scholarship. The course of study was a long one, and it was not until 1916, that she made her real debut, as Lisa in Tchaikovsky’s The Queen of Spades at the Mariinsky Theatre which was a success. The revolution and civil war brought many ups-and-downs. In 1921 she escaped to Berlin. Early success in Germany brought a call from Diaghilev to join him in Paris to star in the premiere of Stravinsky’s opera Mavra. 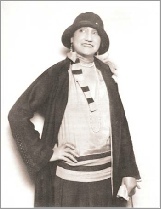 She did not like the piece, but the opportunity was not to be turned down, and so she appeared as Mavra in 1922. She had a successful solo debut at Carnegie Hall in New York too but had difficulties with finding a good manager. Slobodskaya took to self-management, but that did not work at all. 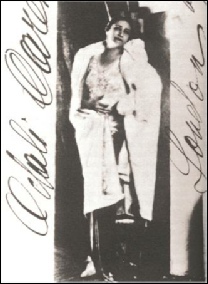 She was reduced to appearing in Vaudeville under the pseudonym of “Odali Careno.” In 1931 she was back in opera, with Chaliapin at the Lyceum, and she made England her home. She married in 1932. Things started to pick up, and in the same year she began a career at Covent Garden, principally in Wagner. 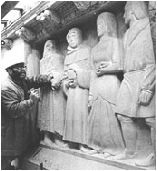 Appearances at the Colón and La Scala followed. The 1930s were kind to her, but even before the end of that decade she was beginning to be worried about vocal decline. Then followed wartime entertainment work, and participation in the National Gallery Concerts of Myra Hess. 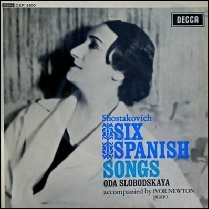 After the war, during which her husband had died, Slobodskaya’s career never really looked up, but Saga records “rediscovered” her in the late 1950s and released two LPs with her. 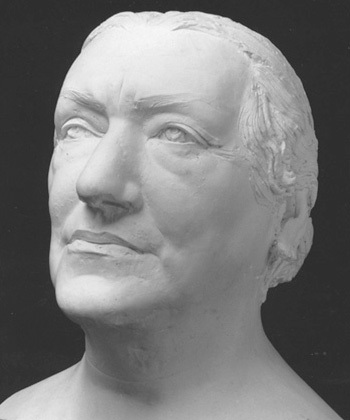 By this time she had virtually retrained her voice from lyric soprano to a (dramatic) character-mezzo. The records were superb and were claimed as such. 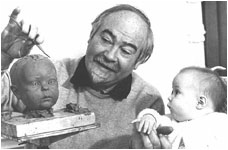 This prompted Decca to wake up to the fact that they had several unissued Slobodskaya recordings from 1939 - 1945. They were released in 1961. A fine set of Polish songs and a LP of classical Russian art and folk songs followed. 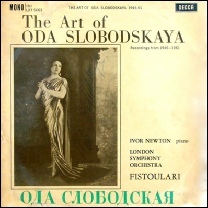 After a painful illness, Oda Slobodskaya died in 1970.